It might surprise industry outsiders to discover that chefs struggle to feed themselves on the job. At mealtime, they’re busy cooking for their customers, and when faced with a long prep list in the high-pressure business, self-care can fall off the bottom of the page. Chef Tania Ganassini knows this first hand and has made it her mission to shift the paradigm. She and business partner Amanda Ali, who has a background in international health and nutrition, have just launched Staff Meal Niagara, a plant-based, nutrition-focused meal delivery program in Niagara-on-the-Lake. “We want to make nourishing yourself a priority in the service industry,” Ganassini says. 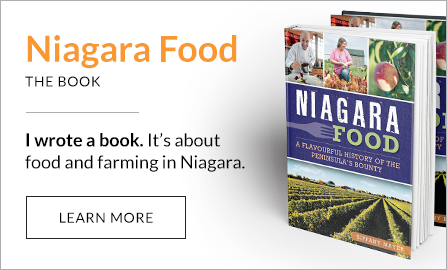 Restaurants, wineries, breweries, and other outlets in the Niagara region have an appetite for what they’re cooking. 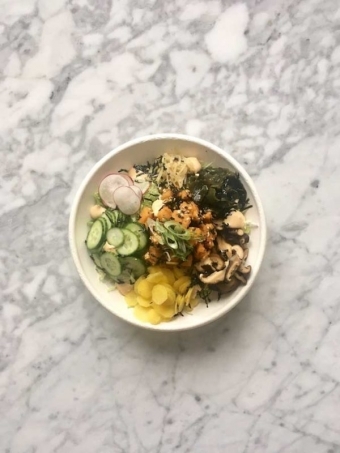 Staff at Ravine Vineyard, Oast House Brewery, and Garden City Essentials are ordering bowls like the “Hokey Poke” made with sweet potato, Japanese black rice, wakame seaweed, and cashew mayo, or a “Matcha Made in Heaven Smoothie” made with organic Japanese matcha, organic spinach, mango and coconut milk. Amanda Ali and Tania Ganassini of Staff Meal Niagara. All photos supplied by Staff Meal Niagara. Hokey Poke by Staff Meal Niagara. The two women met while working at a brewery and bonded over a shared passion for good cooking. Ganassini is a chef school graduate with a resume that includes work at Café Boulud and Canoe restaurant in Toronto as well as studies in Italy. Ali’s degree is from UBC, and after she attended one of Ganassini’s classes in bowl cooking, the business idea began to bloom. Beyond the restaurant business, they have their sights set on the corporate and health-care sector. Private and freelance clients are also placing orders. JoAnne Wang, a local user experience (UX) strategist and designer, gives Staff Meal Niagara rave reviews. Chefs are not unique in the struggle to find time to eat at work. A 2017 study from Dalhousie University, “Disintegration of Food Habits,” found 23.9 per cent of Canadian’s surveyed purchase ready-to-eat breakfasts once or twice a week. At lunchtime that number rises to 45 per cent. In Ontario, 61 per cent of respondents don’t leave their desks to eat lunch. Canada’s 2018 Food Price Report is projecting the average Canadian home will spend almost 30 per cent of its food budget on ready-to-eat and restaurant meals, the highest level in history. Creating a business that delivers delicious and nutritious meals in such a climate is a smart move. The food values of Staff Meal Niagara also reflect those in Canada’s new food guide, expected out any day now. The 2018 guide is the first update in ten years and suggests Canadians consume more nutrient-dense foods and shift towards a high proportion of plant-based foods. 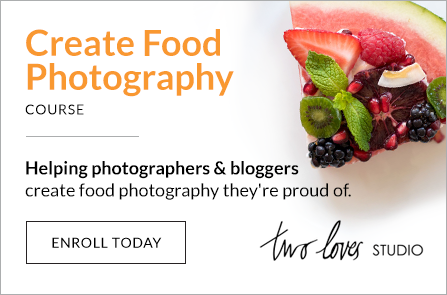 Ganassini and Ali are working with experts, like a holistic nutritionist, to ensure their meals are on spec for calories, nutrients, and portion size. The pair scored a big vote of confidence when they won a Dragon’s Den-style pitch competition at a Dream, Girl event last July. They put the $1,000-bursary into the business and are receiving mentorship from a successful local businesswoman. Staff Meal Niagara is filling a gap in a niche market in the region. Their commissary kitchen is in Niagara-on-the-Lake. Most of their clients were already spending up to $15 on lunch outside the workplace. One of their internationally inspired bowls is competitively priced at $13. Menus change every two weeks and orders are placed through their website for delivery on Thursdays. “I love the international flavours they explore, and I find the value to be spot on,” Wang says. Kimchi Jjigae by Staff Meal Niagara. No surprise to discover that they’re also concerned about the environment and local community. Take-out containers are biodegradable and recyclable. They hope to soon deliver by electric vehicle or bicycle in good weather, too. Giving back to the local community by addressing issues of food insecurity is also written into their business plan. They’ve already made a donation to Lunch Angels Niagara, an organization that provides children in the region with a healthy lunch. They want Staff Meal Niagara to be an example of how to make a cultural shift toward sustainability, Ganassini says. Deborah Reid is a Toronto-based writer and chef whose work has been published in The Globe and Mail, CBC, Taunton’s Fine Cooking and Eater. Fantastic concept. I would have loved this service in an office I worked in where we did not take a lunchtime or had breaks. We grabbed whatever food we could at our desk and worked through our entire day. This would have been a nutritious way to eat. LOVE what they’re doing! Good for the consumer and the planet. Welcome to 2018!